A catastrophic jetliner crash. A billion-dollar lawsuit. The defense? Kill anyone, even a Supreme Court Justice, to win the case. Was negligence or terrorism responsible for the horrific Everglades jetliner crash at the center of Impact? That’s what a billion-dollar lawsuit must decide in this thriller from bestselling crime author Paul Levine. As the lawsuit winds its way through the federal courts, law professor Sam Truitt ascends to the Supreme Court. Truitt’s high ideals and lofty intentions hide a troubled marriage. At his side is Lisa Fremont, his stunning and brilliant law clerk, who has a dark secret in her past. Will this be the case that costs them their lives? If Lisa fails to secure Sam’s vote in this high-stakes lawsuit, she’ll lose her life – and so will he. He’s always lived by the rules; she never has. But in this gripping tale of seduction and betrayal, the two must join forces to battle those who live by no law at all. 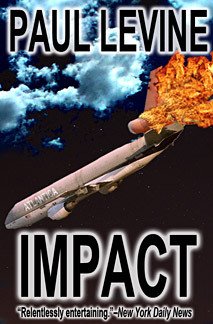 Impact was the inspiration for television drama First Monday, starring James Garner and Joe Mantegna. Now available as an ebook and trade paperback, it was originally published as a hardcover titled 9 Scorpions. Read what others have said about Paul Levine’s thrilling novel.